Sorry... the 2017 BMW X1 is no longer being sold as new. Instead, take the first step to a great deal on 2019 BMW X1 with a free price quote! 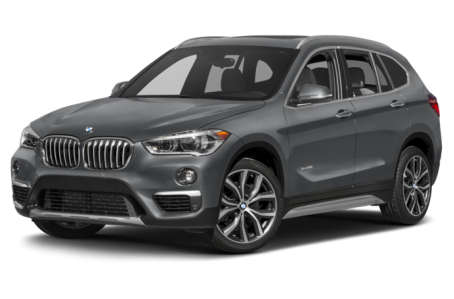 The 2017 BMW X1 is the smallest luxury SUV in the lineup. It competes with the Mazda CX-3, Mercedes-Benz GLA250, and Lexus NX 200t. This year, it receives a less expensive front-wheel drive version. M Sport suspension and sport seats are also available. Two trims are available: the new sDrive28i and xDrive28i. The X1 has a chiseled and sporty appearance with angular, aerodynamic forms to complement its compact size. Standard features include LED daytime running lights, power and heated side mirrors, front fog lights, and 18-inch alloy wheels. LED headlights, a panoramic moonroof, and larger 19-inch alloy wheels are available as well. Powering the X1 is a standard 228-hp, twin-turbocharged 2.0-liter 4-cylinder engine mated to an 8-speed automatic transmission. The sDrive28i comes with front-wheel drive, while xDrive28i has all-wheel drive. Fuel economy for the sDrive28i is an EPA-estimated 23/32 mpg city/highway. It lowers slightly to a 22/32 mpg rating for the xDrive28i. Inside, the 5-passenger X1 has an upscale interior that comes in a number of available color schemes and finishes. It has improved rear headroom to 34.9 inches and overall cargo room to 59.7 cubic feet when the rear seat is folded down. Protruding above the center console is the standard iDrive multimedia system. It has a 6.5-inch touchscreen with controls for phone, audio, radio, navigation, and other information. Other standard features include a tilt/telescoping steering wheel, power-adjustable front and rear seats, power windows/locks, remote keyless entry, and push-button start. A heads-up display, an integrated navigation system, garage-door opener, an automatic dimming rearview mirror, heated steering wheel, adaptive cruise control, and a Harmon Kardon premium audio system are available as well. Standard safety features include airbags for the front, knees, overhead, antilock brakes, an electronic stability system, rain-sensing wipers, and tire-pressure monitoring system. An automatic reverse sensing system, parking assist, park distance control, and a backup camera are also available. 24 of 25 (96%) consumers said they would recommend this vehicle to a friend.